The web pages in this section do not cover legal matters. The pages here describe the step-by-step process of getting started after legal matters are taken care of. The first step is very easy and perhaps you already know what subjects your child will study in homeschool. You should check your state laws to find out what sort subjects they require (if any). For the sake of your sanity and because this is true, I will tell you the classes that **do not have to be done every school day are displayed in green. **Classes that do not have to be done every school day: I marked those classes with the color green. My recommendation does not indicate how often to do the classes; that part is up to you, the homeschool planner/parent. Take some time and think about what your child should do in the coming year and write it down, that will make choosing curriculum easier. Trips to the library can be more fruitful with your goals list in hand and you will have a guide when you get forgetful. Goals can be made for short and for long periods of time. The goals can be for things other than academics, such as character goals. The course of study for grades 6, 7, and 8 is like the course of study for 4th and 5th grades, however, handwriting can be dropped if the student is doing well with his penmanship. Spelling is also optional after grade 6. If your child needs to continue studying spelling, do so, I recommend Natural Speller. Reading should take on the class name and the elements of Literature, and the student should still continue studying critical reading, comprehension, and vocabulary. Class frequency in science should increase unless you are already having science 3+ times a week. The high school course of study is discussed in the High School section of donnayoung.org. What subjects will your child take this year, probably the usual, right? This part is not hard. If you haven't already, make your list of subjects. 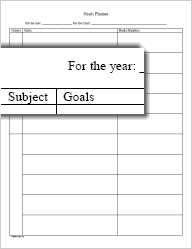 You can write your lists on my forms or write the list in a notebook or in your word processor. I usually make mine on a course of study form because making a course of study is step number three. I want to you to consider looking at a standards lists. I have World Book's lists linked on the right hand side of this page. You can look at them for free. I know that some of the items are cryptic. When you read them, you will see that it is more or less a list of topics to be studied at the appropriate level. There are a few books that tell what to teach and when. You'll find them in homeschooling catalogs, libraries, and curriculum fairs. Do you need a standards book? I can't answer that for you, some find them handy, and some find them a comfort while others rely on their choice of curriculum to cover standards and they do not buy a standards book, and some do not ever think about it. I used to wish I had one, especially after hearing a homeschool mom rave about hers, but I was always short on book funds and I managed well enough with the World Book's standards and with public school standards books that I found at the library. Boxed curriculum tend to publish their standards. Some charge for their scope and sequence and some do not. Optional, but consider making goals. Goals can, at first, be like standards and copied from standards lists. But more importantly or eventually, the goals should come from what you know about your child and what sort of things that he needs to work on and accomplish. The more you homeschool, the easier this will be. Read more in the column on the left. If you aim for nothing then nothing is what you will usually get. Sometimes homeschoolers start homeschooling a child who is close to or in high school. If your child is in 8th grade or in 9th, then follow the steps for planning high school at High School Help. If your child has already started high school, find out what your child has taken and find out what your child should take in order to fulfill requirements for graduating in your state. High school tip: Before high school starts, plan the course of study for all fours years. See High School Help.